At Moses EyeCare Centers, we are pleased to offer a wide range of optometry services for our community! Our experienced optometrists can provide you with thorough eye evaluations, determine if you need corrective lenses and your exact prescription strength, fit you with the appropriate specialty eyewear, and help you pick out the most flattering pair of glasses for your face shape and skin tone. Moses Eyecare Centers is your “Family Doctor” for vision and eye health services. Whether Pink Eye, Glaucoma, Cataracts, or regular checkups, glasses or contact lenses, we are the first stop for family eyecare. Caring for changes in vision or eye health from diabetes, high blood pressure, and other general health problems is part of our commitment to you. Unlike Optical Stores that simply sell you glasses, our comprehensive approach does not end with eyewear. Your total health today and tomorrow is our ongoing concern. Our Primary Care Services go far beyond regular eye health examinations. Since many vision-threatening afflictions offer no warnings or symptoms, we diagnose and treat Glaucoma, manage ocular complications of diabetes and hypertension as well as other conditions, to preserve your vision. For your convenience we keep you advised of regularly scheduled appointments through your choice of text, email, and phone calls. We also handle eye injuries and infections as emergencies in our offices and we always have a doctor on call 24 hours a day. ‘Lazy eye’, ‘Crossed eye’ and Dyslexia are terms familiar to most of us. However, these and related eye coordination conditions can be invisible to many parents and patients. Early diagnoses – as early as age 3 – and proper treatment may avoid the need for surgery or unnecessary loss of vision. Ordinary eyeglass examinations do not look for these problems. Special testing and experienced professionals like those at Moses Eyecare Centers are critical in recognizing and caring for these deficiencies. 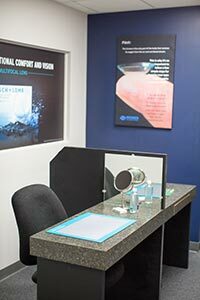 Moses Eyecare offers an abundance of contact lens options including dailies, monthlies, toric lenses for astigmatism, multifocals to help your near vision without reading glasses, tinted contact lenses, and even RGPs or “hard” lenses. Our doctors are experienced in caring for straightforward or complex cases, regularly succeeding with patients who were previously unable to wear lenses. We also offer competitive pricing, special manufacturer rebates, and work with your vision discount plans to make sure that you receive the best vision and comfort with your lenses at an affordable price. With our wide variety of contact lenses, we’re sure to find a fit that is perfect for you! Click on the logos below to learn more about the types of contact lenses we carry. Many people wonder if they are candidates for lasik, and this depends on your current vision, as well as the structure and health of your eye. Not all people are candidates, however we will meet with you and discuss your options. In the LASIK procedure, instead of removing the surface of the cornea, a flap is created in the surface of the cornea and folded back, allowing the laser access to the tissue underneath without damaging the surface. The laser then changes the front of your eye to match your glasses prescription. Since the front surface of the eye is quick to heal, when the flap is laid back down it quickly reattaches itself to the tissue underneath. Moses Eyecare Centers will provide care before and after the surgery. 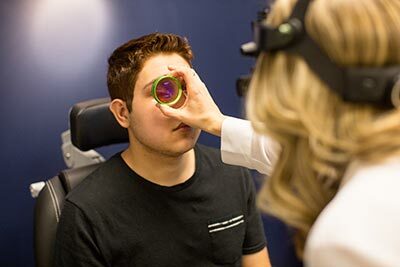 Before you have the procedure, the doctors at Moses Eyecare will perform a comprehensive eye exam including a topography (see advance testing for more information). After the procedure, we will monitor your healing to make sure you have the best outcome possible. Schedule your eye exam today by requesting an appointment online or by calling our office!